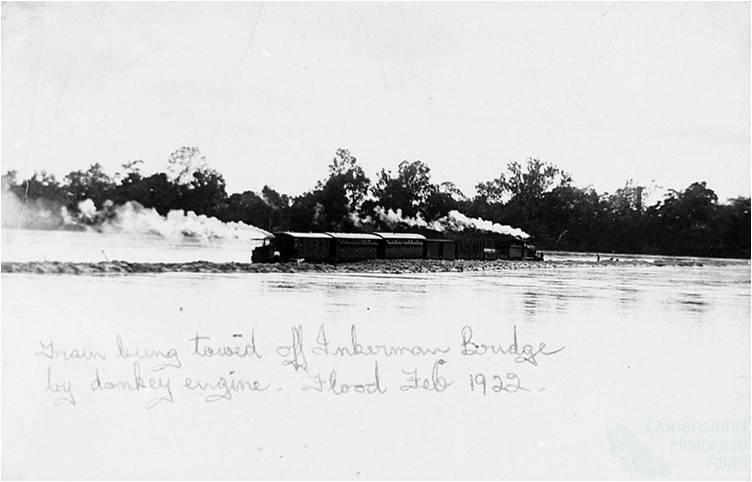 Survival in Queensland during climatic extremes has often relied on the rail network. The rail tracks until recently were often more reliable in flood than roads, especially where culverts were constructed rather than bridges. In drought rail took the stock away, and brought stock back in the good times. But lack of water impacted on the serviceability of steam locomotives. Queensland covers a vast area over 1,730,000 square kilometres. Some areas of the State can be in drought while others are suffering from prolonged heavy rain and flooding. Drought affected areas can also be subject to flooding due to heavy rains in river catchments hundreds of kilometres away without actually having any rainfall. These floodwaters can take days, and sometimes weeks to travel downstream and in western Queensland this is called a ‘dry flood’. Within two years of the opening of the first railway from Ipswich to Grandchester in 1865, the railways were affected by drought and by flood. The locomotive water supply at Grandchester failed due to a prolonged period of dry weather. Consideration was given to deepening the well at Grandchester and installing a pump to provide a surety of supply. An adequate supply of water is essential for the operation of steam locomotives. Although there were hundreds of watering points for steam locomotives across the State a lack of water in arid areas and during periods of drought required the use of water tank wagons attached to the locomotive to augment the supply in the locomotive’s tender. A drought in 1926-27 necessitated the railways carrying 386,753 tons of water for locomotives and to supply rail workers with drinking water compared with 139,541 tons in 1924-25 before the drought. The magnitude of this transport task can be realised when it is considered that if the water were carried in full train loads of 250 tons each, it would require 2578 fully laden trains. 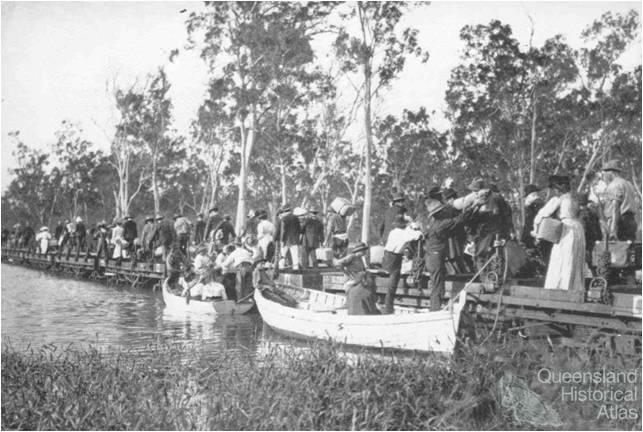 Construction of the Central Railway from Rockhampton, which had reached the 209 kilometres point by the end of 1877, was slowed due to a severe drought. Water had to be carted from a dam at Wallaroo about 96 kilometres away, in order to provide drinking water for the construction workers at the end of track. The drought added significantly to the construction costs and threatened the supply of labour. There were 131 fewer men working on construction than in the previous year, 1876. Water had to be supplied to livestock used by the construction workers as well as the men themselves. The average workforce on the construction of the Central Railway in 1877 was 608 men, 246 horses and 122 bullocks. 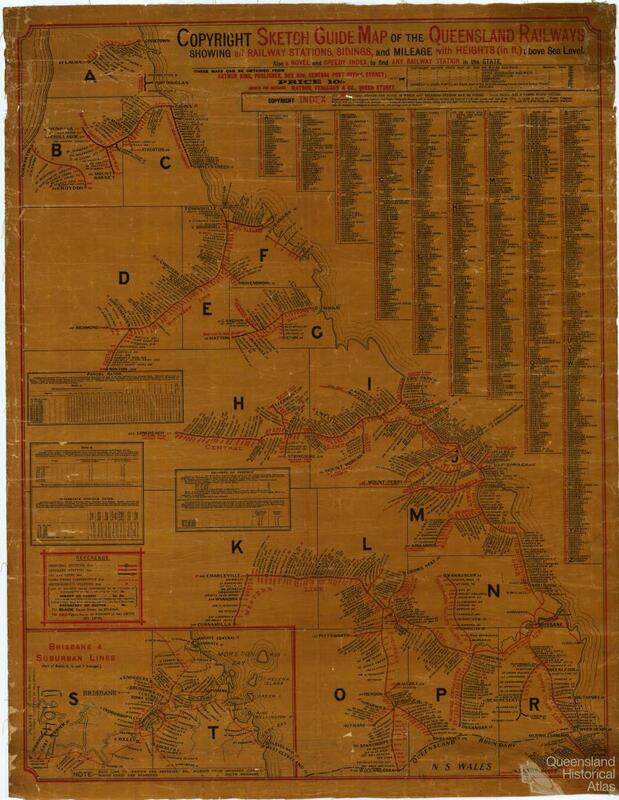 The railways provided a lifeline to outback districts during periods of extended drought. Transport of fodder to drought affected areas; livestock to districts not drought affected and special water trains could all be offered by the railways to assist outback communities. Floods had a more direct and severe impact on Queensland’s population causing damage to the railways infrastructure. Delays to train services caused by flooding might only be of relatively short duration, but sometimes the disruption to railway traffic might last several weeks waiting for floodwaters either to recede or wash along the tracks before infrastructure could be repaired. 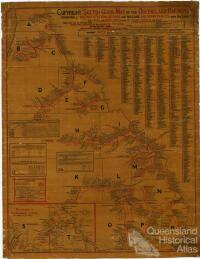 The Ipswich to Grandchester line was affected by flooding early in 1867. The stone abutments of the Bremer River Bridge in Ipswich showed signs of cracking and failure, while the railway embankments in the Mihi area were subsiding due to flooding. The line was deviated and built to a higher level to overcome this problem. Additional flood openings and larger culverts were built along the route as a consequence of problems with wash-aways and subsidence. The first railway bridge over the Brisbane River at Indooroopilly opened on 5 July 1876. It had been built 8.8 metres above the highest known flood at the time. A flood in 1890 came close to washing the bridge away. 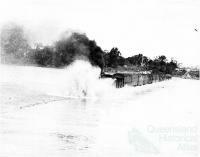 The 1893 flood was far worse resulting in the bridge being carried away on Sunday 5 February. 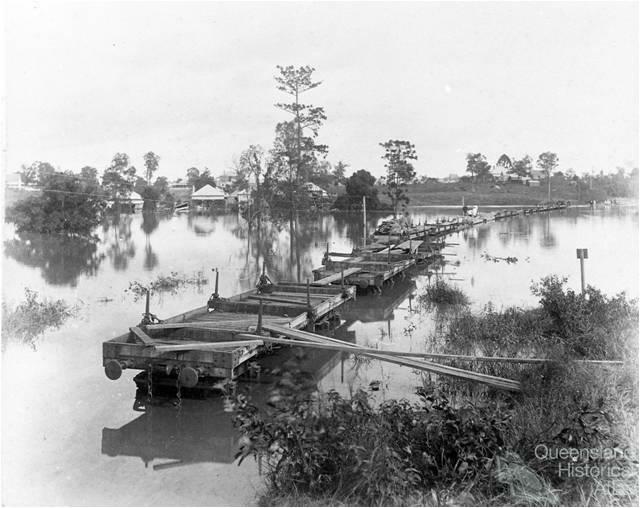 The 1893 flood undoubtedly had major implications for the railway network with the loss of the bridge at Indooroopilly and another at Antigua, south of Maryborough also washed away. Locomotives and rolling stock could not be sent to the workshops at either Ipswich or Maryborough for overhaul because the two bridges had isolated these centres. Essential repairs and maintenance had to be undertaken at the locomotive depot at Countess Street in Brisbane. 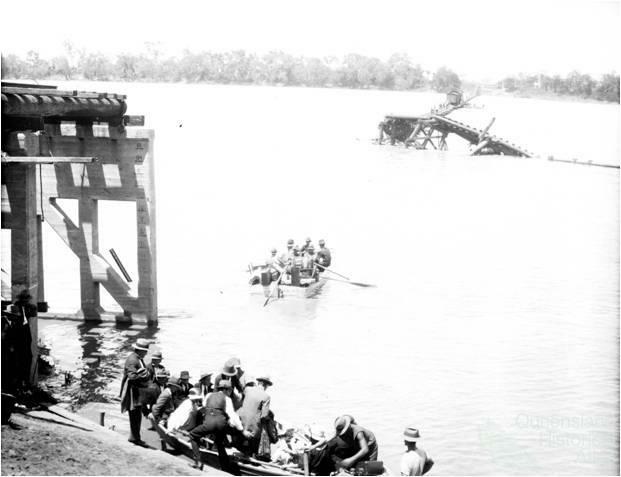 The low-level bridge over the Burdekin River on the North Coast Line, between Home Hill and Ayr was a constant problem from the time of its construction in 1913. The Burdekin River was a wide, mostly sandy river bed with a few water channels but in the tropical wet season it would soon fill with water which would flow across the bridge stopping rail traffic. 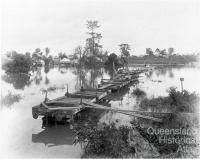 When the line was cut due to flooding, boats were used to ferry passengers across the river to another train waiting on the other side for them to continue their journey. The bridge was replaced in 1957 by a high level concrete and steel structure that is well above flood height. The road linking Normanton with Croydon was mostly impassable during the monsoon season. The isolated rail line which opened in 1891 joined the two towns and was a vital link for passengers and supplies during the wet season. 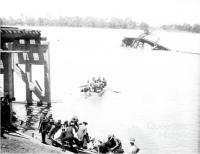 During an 1895 flood passengers completed the 151 kilometre journey from Normanton in 19 hours – a train left Normanton and travelled a short distance, passengers were then transferred to a boat, then to a fettler’s trolley and another boat, then once again fettler’s trolley to Blackbull where they were met by another train that had travelled from Croydon. The road between the two towns is now much more reliable but the railway has survived to become a significant tourist attraction in the outback of the Gulf Country. The railway network today is still an essential component in the management of extreme weather conditions throughout Queensland despite the closure of many branch lines. The survival of the railway infrastructure itself adds another dimension to the history of droughts and floods and rail in Queensland.